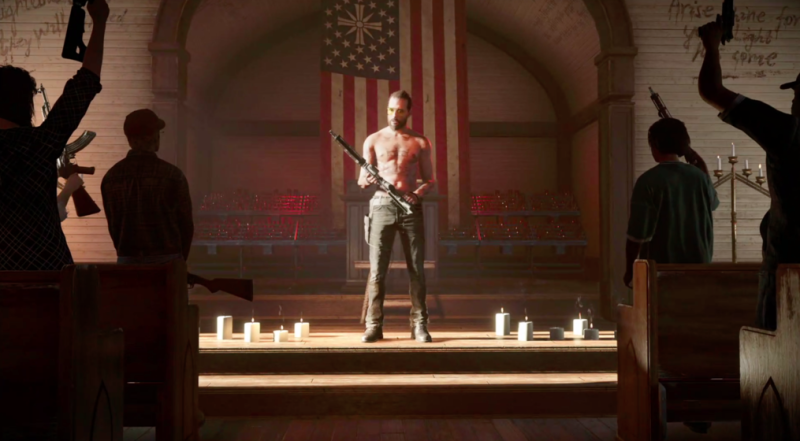 At E3 2017, Ubisoft showcased the first gameplay of Far Cry 5 this time set in Hope County, Montana. Thanks to the gameplay we can see a very detailed world with abundant details, where we will have the support of a partner who can indicate what to do at any time. As an example, in the beginning of the trailer, our partner takes a privileged position that allows you to open fire while serving as a distraction to facilitate the assault. You also have a dog too to distract enemies, of course, the incorporation of the dog is now fashionable in the shooters. Moreover, a great variety of weapons, vehicles have been added to the game which can massacre the enemy. Nothing better than watching the trailer. With the Gold Edition of Far Fry 5, you will get the game’s soundtrack, a Steelbook case, a 45 cm deer skull trophy “with a Far Cry twist,“. The Gold Edition of the game also includes the season pass, which adds “additional stories, content and gear, and the Digital Deluxe Pack, which includes additional vehicles, weapons and outfits.” The Collector’s Case is only sold on Ubisoft’s online store for $180.